We have already talked about how Otto Herzog first developed climbing specific karabiners in 1910 and how steel was used until the secret of hardening Aluminium was discovered by Wilm. What we have not told is the story of how their design has been tweaked and modified since. To a point where we now have specialist karabiners depending on whether we are sport, or trad climbing. 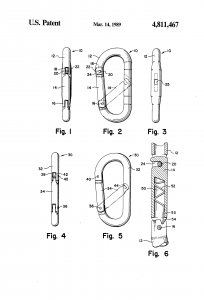 Whilst we take for granted nowadays that all karabiners are safe, back in the 1950 and early sixties it was more a case of buyer beware. Whilst most manufacturers were also climbers, so were not going to bring something they thought dangerous to market. 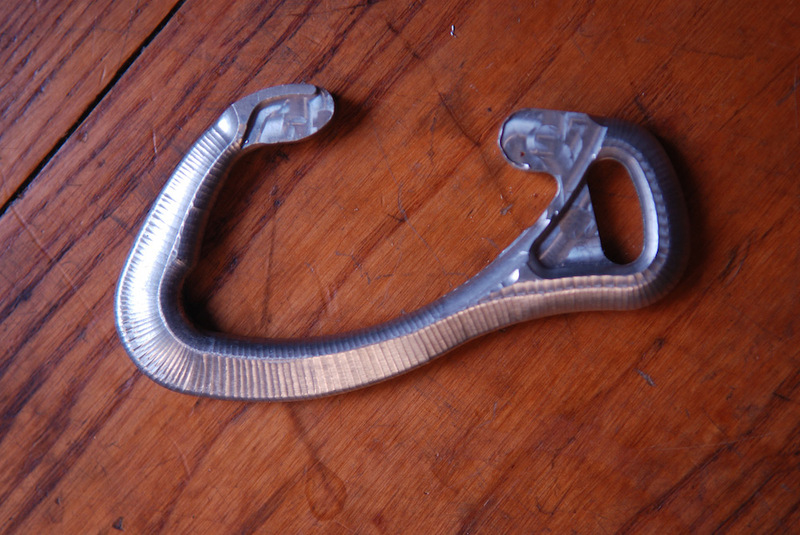 The strength of the karabiner was ultimately down to how strong a manufacturer thought was strong enough for the job. As a result some were so close to the limit as to be worryingly dangerous. The need for safety standards was first addressed by the UIAA, although they didn’t finally ratify those standards until 1965, five years after the process had started. At least the breaking strain was used as a marketing point along with the weight of the karabiner. Although without a standardised test or statistical models how accurate and precise those breaking strains were is an interesting thought. In using weight and strength as a marketing point manufacturers launched themselves on a seemingly unending quest for the best strength for the minimum of weight. Interestingly karabiners seemed to very rapidly reach a mutually independent strength. 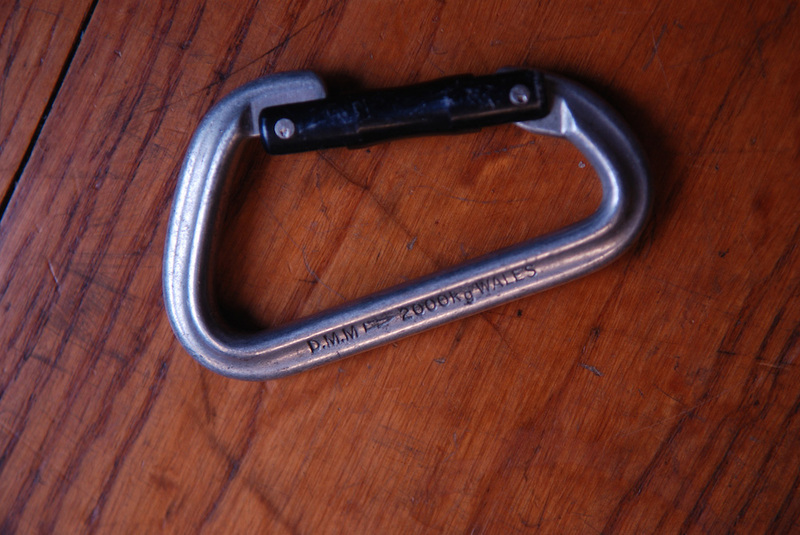 In that any karabiner from the towards the end of the 1950 and early 60s generally had a breaking strain of around 2000kg. This is very similar to the 22kn or more that most modern karabiners will hold. Whilst to make the karabiners light, companies experimented with different diameter of aluminium bar stock, most flocked toward the 7075 aluminium alloy, which was originally used in the Japanese Zero fight just before the war. Its strength to weight ratio made it an ideal material for lighter yet strong biners. After a while they reached the limit of what was possible with a solid bar so one company experiment with hollow tubing. 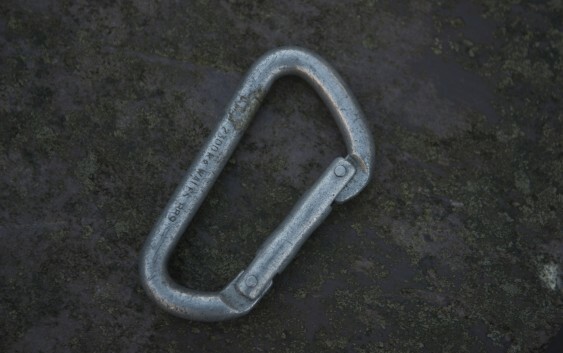 That company was Salewa, in the adverts of the time they suggested that the karabiner had a gate closed strength of 2000kg and weighed a staggering 42g, a saving of around 30% compared to its nearest rivals. 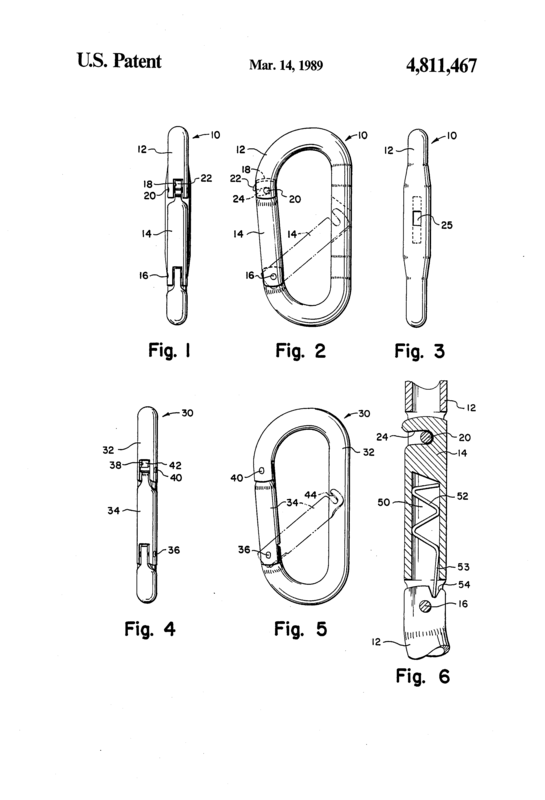 There are suggestions that there was a court case against the US importer of these karabiners, Royal Robbins, but whether it was a hollow karabiner that failed has been difficult determine. Robbins did successfully defend the case showing the climber had misused whatever had failed. It did however lead to his import business focusing on clothing only. Essentially though all companies were limited by what they could do with the material using the manufacturing process they had to hand. It would take a new form of manufacturing to get the very best out of the materials. One company DMM have been at the forefront of these new technologies ever since introducing cold forging and the Lightning karabiner in the mid 1980s. This was a marked step forwards, as for the first time the metal in the karabiner was being moved away from where it wasn’t needed like the back bar and toward those bits that need a little reinforcing like the curves at the top and bottom. Cold forging was essentially hammering the shape require from a die into the roughly formed shape of a karabiner made from a solid bar. This is done whilst the metal is cold, hence the cold forging. The excess was trimmed and it resulted in new era of strength and lightness. It also ushered in an era when shape and design were going to be equally important. After all why go to the trouble of squeezing the metal where you want it, if at the same time you aren’t going to try and make it look nice as well. It was this blend of the utilitarian and visually aesthetic design that really stood DMM out from the rest of the crowd. Something that they would take and make there own a few years later when they took the manufacturing process one stage forward when the introduce hot forging. This was very much like the cold forging but because the metal and the die were hot made the metal was more malleable and could therefore be force to take on much more adventurous and radical designs. The first piece of equipment that DMM launched using this technology was the Mamba sport climbing quickdraw. The prototype of the DMM Mamba quickdraw. So good they still make it over 20 years after first producing it! As weight wasn’t an issue in sport climbing as the number of quickdraws taken is limited and there was a growing trend of redpointing, where the draw were left in situ whilst climbers worked the line. As such the emphasis was instead on a design that was at the extreme end of the usefulness scale. What was useful for sports climber was the ability to get the rope into the draw as quickly as possible. The Mamba is so good at what it does, some twenty years after first introducing it to the world of climbing it is still being manufacturer. It is still exactly the same as when they first launched it. As such I would suggest it is a design classic, the blue jeans of the sport climbing world. Of course we now have I-beam karabiners, that have taken the weight to its limit, and there are some extremely lightweight designs on the market. Some though have arguably gotten so small and light that they can be hard to handle. There is one brand where every time I clip the rope into it I trap my thumb in the gate. So weight has come at a cost to utility in some cases. 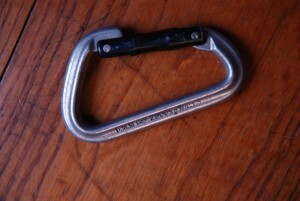 There is one karabiner that is especially unique as it helped come up with a solution to an age-old problem of rope drag. How it came to be was the design team at DMM sat down for a brainstorming session. Someone asked what the heaviest thing of the rack is. When someone answered the rope, they realised that whilst they couldn’t make ropes much thinner or lighter they could reduce friction that causes rope drag. How they did it was to put a pulley in the bottom of a karabiner, and in doing so opened up a whole world of different application, so as well as being great for leading sinuous routes it was also really good for crevasse rescue or a small part of a hauling systems on big walls. These advancements in karabiner design are interesting as it wasn’t a new material that helped push us on to greater things, but instead it took a whole new manufacturing process to make everything lighter and in the main more useful. If you ever get the chance to visit a DMM factory do, it is amazing the processes they use nowadays. One karabiner will under go somewhere in the region of 17 process by an almost equally numerous number of machine operators. All so we can have the best, lightest and safest equipment to climb with. DMM Lightening Karabier, the worlds first hot forged karabiner.